Two cans and pennies. That’s all I needed to play my game. Plus strategizing! Connecticut up to Rhode Island — once a month to visit my Uncle Jack. I called it my Penny Game. He was a patient at the state veterans’ hospital up there. He was getting close to 100 and I was the only visitor he ever got now. My game was simple. I played it all the way up. Great fun. So remarkable the way it sharpened my driving skills. Every time I tapped my brake pedal would cost me one penny. The idea was to finish my ride with the fewest brake taps—the fewest pennies possible. The idea was to beat my score every trip up. Patience, practice, concentration, skill—those were my challenge. It has paid off to this day though I no longer play it. I quit when Jack passed. He was 97 when I started. He died just six months short of the 100 he was shooting for. So I made the ride many times. It was 105 miles from home in Deep River up to the hospital in Bristol. Yes, a state hospital, not federal. Jack really, really qualified to be a patient—was in the Infantry and was one of those who hit the beaches in France to fight the Germans in World War II. Saw brutal action, so brutal he never talked about it. My ride took me up through one of the most densely populated and tricky areas we have. It was not just one fast, straight, uninterrupted cruise through empty central Texas or wide-open Arizona, say. Here’s what it involved. First, an easy nine-mile ride to Old Saybrook, Conn. Then 60 easy miles on I-95 up to tiny Wyoming. Yes, Wyoming. I never figured how we got a Wyoming in these parts. I’d turn right on R.I. 138, which was long and slow with several lights. It snaked me up through Kingston, the home of the University of Rhode Island. Easier when the students were gone. The village gives a clear view of Newport over on the eastern shore of the bay. It was just 15 minutes across the island to the huge, wide, and high Newport Bridge—it was designed to let enormous aircraft carriers get up to their base at Quonset Point. A toll bridge. So you had to stop. Bad to arrive with several cars ahead. All of us moving forward one car length at a time. So much braking! So many pennies! I visited him once a month and I got to know the route cold. It would have been humdrum without my game. Why all this detail? To give you an idea of the varied driving conditions I faced. So many challenges. Hard to imagine more variety. But playing a game while driving? That could be distracting … dangerous maybe? No way. All I needed were two tin cans and lots of pennies. The two cans might be a soup can and a coffee can. I loaded the pennies into the soup can. It could have been peanuts, buttons, peppermint candies, anything easy to count. Pennies were perfect. I had no idea how many I’d need, so I picked up four rolls — 200. Heck, I might turn out to be a worse driver than I thought. It turned out to be far too many. So every time I’d hit the brake pedal, I’d toss a penny into the coffee can on the floor. Being bigger, it was an easier target than just another soup can. 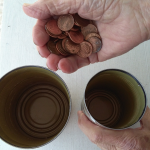 The first time I used 118 pennies—that’s the figure I remember– and that turned out to the most I ever had to use. I got better and better at it. My best, as I recall, was 27. That 105 miles had segments wildly different. Starting, I’d take the familiar old Conn. 154 eight miles to Old Saybrook, which borders Long Island Sound. Then I’d turn north on I-95 and cruise up to tiny Wyoming in Rhode Island. Yes, Wyoming, R.I.—I never understood why we had a town named that. That stretch was about 65 miles, the longest. Then a right turn on R.I. 138. That was slow and curvy and led me through tiny Kingston. It’s the home of the University of Rhode Island. That could mean lots of stop and go when the students were around. Then a left on R.I. 1 but only for 3 miles or so. Then a right on the second leg of 138. That would take me down the long, straight and steep slope to beautiful Narragansett Bay and its two famous bridges.. The two bridges were exciting because I’d get brief but magnificent views on both sides—on the left of the island-rich bay leading up to Providence, and on the right, of the open Atlantic in the not far distance. It also gave great views of the Naval War College atop a bluff on the left, and on the right of downtown Newport. Who hasn’t heard of Newport and its glitzy mansions built by show-off millionaires a century ago? But not visible from the bridge. Now I’d be on the eastern shore. I’d head north, again on busy and congested 138 for three miles. Then a sharp left on old and narrow 114. This took me quickly to the Mt. Hope Bridge, named for the big and beautiful bay on the right. The Mt. Hope Bridge is an impressive suspension bridge but narrow. It was an engineering marvel when built close to a century ago. Not much traffic back then. For decades you had to stop and pay a toll. It arches high enough to let large oil tankers make a right turn from Narragansett Bay and go on thefew miles to industrial Fall River to pump out their cargo. I’d get irritated every time I’d cross that bridge. From its crest high up you’d have the potential for superb views of both bays. But! The engineers gave little thought to tourists. Their massive guardrails totally block the views. What a shame. Now the ride became pretty. Scenic. Roger Williams University, named for the minister who founded Rhode Island as a haven for settlers oppressed by the stern religiosity of the Pilgrims, has a beautiful campus. It’s perched on a crest overlooking Mt. Hope Bay. Over the bridge, lots of greenery. Lighter traffic. Peaceful. Fine estates on the Narragansett Bay side. Finally Bristol. In its day Bristol was the capital of the State of Rhode Island and Providence Plantations. That, by the way, is the state’s official name. Interesting, don’t you think, that our smallest state has the longest name of all 50? Bristol has great charm. Fine old buildings of changing architecture, from colonial to modern. A Main Street lined with nice old homes and restaurants and boutiques of all kinds – art, antiques, furniture, on and on. The long street is striped red, white and blue along its middle for a long way. Bristol hosts an enormous parade down the street every Fourth of July. A Coast Guard station. Lots of pleasure boats. And, most noteworthy, magnificent Colt State Park right on a prime stretch of manicured lawns along Narragansett Bay. In nice weather, after my visit with Uncle Jack, I’d try to squeeze in a ride through it. My leave-taking would take a toll. I needed this balance. Well, a couple of short turns now and I’d enter the fine grounds of the hospital. Reaching my uncle’s room finally, I’d give him a hug, ask how he was. He’d always say, “So, so.” He had gone there under protest and I sympathized. But it was a smart decision. Then smiling, l’d say, “Hey, only 43 pennies today!” He’d chuckle. I knew he was expecting this report. Yes, he was reaching one hundred. How many men achieve that?! He was a cigar smoker for 80 years, but only a single Philly after supper during his saunter around the neighborhood. Always Phillies. He was s shoe salesman his whole life. Squatting to fit shoes on customers kept him fit. He was down to 110 pounds now and he spent most of his time in bed. But he still had all his marbles. He was my dear Aunt Bernadette’s hubby. She had gone on five years earlier. They were childless. I was his closest kin. An amazing, proud Irishman. He died just six months short of the full century that was his goal. That disappointed him. I know it did. It disappointed me! He had a peaceful and tranquil end. A blessing. So quite a ride, as you can see. Here’s what I had to do the whole way — strategize, strategize, strategize. If I got caught behind a slowpoke, I had to ease off to slow down a bit. If I spotted a traffic light coming up, should I slow down or speed up to catch it while it was green? If a traffic light was at the bottom of a hill, a tougher decision. Would I have to brake 2 or 3 times? Smarter of course to brake only once, but for how long? If a car passed and swerved back hard to get into my lane, of course I’d have to brake. Rainy weather …. snowy weather ….made the whole thing trickier. If I spotted a McDonald’s on the right and noticed five cars in the drive-up lane, no way would I use drive-up. Too much stopping and going. Better to park and walk in. No way would I stop for anything on the left side of the highway. For sure I’d lose 3 or 4 pennies getting in and out. I’d always start with a full tank of gas. God forbid that I’d have to stop at a station en route. Of course at times braking was unavoidable. To come to a halt at a stop sign at the bottom of a hill. Avoid getting rear-ended when I got caught behind a slowpoke. Or when a nut zoomed by me and then cut back in fast. At the hospital, better to select a parking spot that I would not have to back out of. Might have to tap the brake. Of course, it was important to play the game all the way. Crazy to give up just 10 or15 miles short of the hospital. I never played the game coming home. Getting there was enough. But soon I saw I was driving smarter in my everyday driving. Luck was involved. Starting during rush hour would be nuts. A week day seemed better. Rain or snow made a whopping difference. I went alone. I had to concentrate. A companion might get annoyed. As you see, the game was dropping the fewest pennies in the coffee can. Playing it would slow me down in getting to my uncle’s. But I wasn’t trying to beat the clock. My payoff was getting more skillful as a driver. I took pride in beating myself. And I was having fun. Why don’t you try it? It’s a natural if you commute to your job. It can be far less 105 miles of course. Just 20 or14 miles will do it, or 8 or even less, especially if you’re transiting a congested area. Try it for one week. Note your score every time and also significant factors. The weather. Season of the year. The day before Thanksgiving, or after. You get the idea. You’ll have fun, too. May get hooked! Of course there will come the day when you’ll get the brake pedal taps down to an irreducible minimum and the fun will fizz. For sure you’ll get upset by some jerk whose driving forced you to toss an extra penny into the coffee can. The game will make you a better driver, too. Why not get your spouse or kids or a friend on the job started? You’ll enjoy hearing their reports. Just as my Uncle Jack did.